A deal to match former WBO welterweight champion Jeff Horn 18-1-1 (12) with former WBA super middleweight titleholder Anthony Mundine 48-8 (28) in a catchweight bout is close to getting signed with weight the only remaining sticking point. The camp of former Brisbane schoolteacher Horn is refusing to budge on a 70kg (154-pounds) weight limit while Team Mundine are holding out for 71kg (156-pounds). “We have already conceded a lot to Anthony and his team,” said Horn’s trainer Glenn Rushton to the Courier Mail this week. “We have agreed to a 50/50 split and to the fight being a co-promotion rather than our promoter Dean Lonergan staging the event alone. Horn, known variously as “The Hornet” and “The Fighting Schoolteacher”, lost his welterweight crown in a nine round rout to top three pound-for-pound boxer Terence Crawford last June. Rushton is conscious of what back-to-back losses with mean for Horn’s career. Emaid Dib, adviser to Mundine, said that negotiations are in their final stages and he expects the fight to be made in the near future. Horn, 30, has previously stated that the first boxing match he ever saw was the domestic blockbuster between Mundine and Danny Green at the Sydney Football Stadium in 2006. 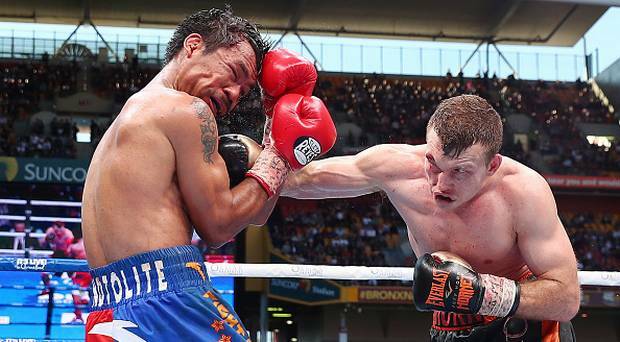 Eleven years later he was in his own blockbuster event when 51,000 fans showed up at Brisbane’s Suncorp Stadium to watch Horn outwork the legendary Manny Pacquiao over 12 fast-paced round to claim the WBO welterweight championship. Mundine, 43, wants the fight to take place in his native Sydney, conceding it could be his last time in the ring. But according to Rushton, the venue for the fight will go to the state with the biggest budget. “It’s quite simple,” said Rushton. “If the Queensland Government decides to back the fight as they did the [Manny] Pacquiao bout, it will be in Brisbane.